Here’s a very useful article explaining the facts of life regarding free trade areas, taxation of foreign goods and border controls. It seems clear that, by leaving the EU, the UK is forcing the re-creation of a ‘hard’ border with the Irish Republic. This has implications for the Northern Ireland Peace Process and it seems clear that this will have to be renegotiated. Considering the fact that we currently have a hugely right-wing and ignorant Conservative government, such talks seem doomed. 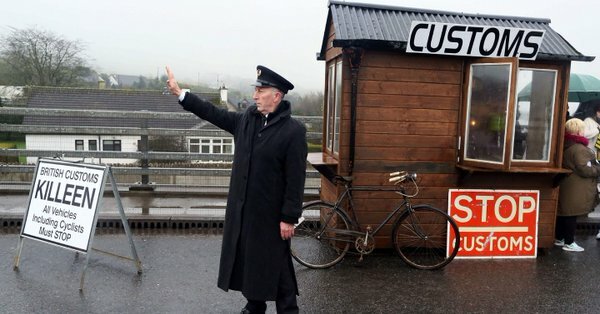 There have been some suggestions in Ireland, since the Brexit vote of June 23rd, to the effect that Ireland and the UK ought to be allowed to cut a special deal to avoid the need for a customs Border within Ireland. These interventions often seem to be ignorant of the basics of trade policy. Checks are inevitable once the North joins the rest of Britain outside EU customs union. Ignorant and narrow minded bigots such as Fox, Duncan-Smith, and Davis care little for the mayhem they cause to this country, or to the rest of Europe, just as long as they get their very selfish way and are able to turn the clock back 50 or more years. I suspect that it will not be too long before the majority in Northern Ireland will soon feel that the best hopes for their future lie with the Republic of Ireland and common sense. The freedom movement between Ulster and Eire existed prior to us being dumped into what we were lied to as a common market trade deal, but even then there were border controls for non Irish/British citizens there is no reason why that older law should not stay in place when the free movement of eu citizens ends. What about the impact on the peace process? It relies on open borders. Eire & Northern Ireland are two separate countries, that is the way the Northern Irish wanted it. Why should there be no Border? The way things seem to be going, Brexit could be achieving something all the thuggery of The Troubles never could: the re-unification of Ireland.